Sigma always aims at contributing to a better society through entrepreneurship, long-term commitment and community involvement. Thus, the company is interested in events focused on developing the entrepreneurial spirit in Ukraine. 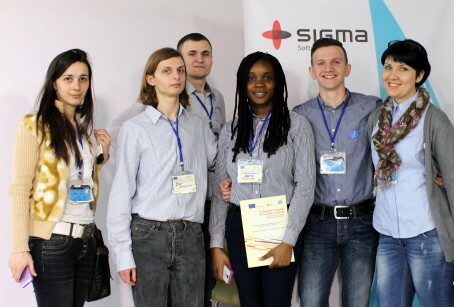 The IT-Eureka contest was open for all students of Ukrainian universities and was supported by the Ukrainian Ministry of Education and Science. The contest had nominations for the best innovation idea and for the best innovation solution. Over 790 students and 444 projects were registered for IT-Eureka. For several months, the contest teams attended regional training, which were conducted by partners and event organizers, and refined their projects in order to present them at the contest finals on March 20th in Odesa, Ukraine. As a general partner, Sigma marked the contest champions with valuable prizes. The winners received the possibility to attend Investor Day Central and Eastern Europe (IDCEE) — the biggest annual conference on Internet technologies and innovations, and compete at the conference’s Startup Alley. “We joined Tempus project back in 2012 because we see great potential of Ukraine and big possibilities in the field of Information Technology. We expected the project would have a strong positive effect. And so it happened,” says Niklas Malmros, President at Sigma Technology Solutions. “During three years Sigma’s experts collaborated on the project mentoring students and helping them to establish efficient working and development processes, contributing to the establishment of the so-called knowledge triangle — a partnership between business, university and students. Thus, we are very happy to support the IT-Eureka contest, which is a great opportunity for all gifted and ambitious students to show themselves,” Carl Vikingsson, CEO at Sigma Technology Group adds.